Leading greenhouse, glasshouse and polytunnel specialist Polydome, supply greenhouses for gardeners, the emerging “grow it yourself” market, and, on a commercial scale, supply the horticulture industry across Ireland. Established in 1985, Polydome manufacture polytunnels from their base near Birr, Co. Offaly where they have their own brand polytunnels and a selection of leading brand glasshouses on display. 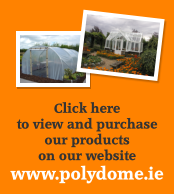 From building a greenhouse to best site requirements for a polytunnel or glass house, Polydome are the industry leaders with over twenty five years experience in the Irish market. 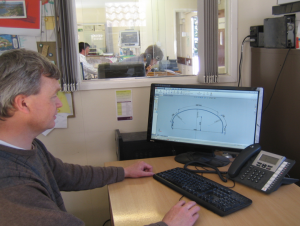 State of the art computer aided design modelling, and an experienced and highly trained team of construction technicians ensure that Polydome customers are happy customers – whether they are small hobby gardeners or large commercial growers. 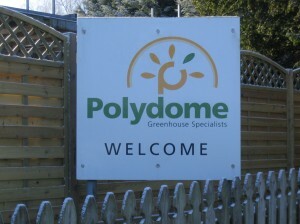 Polydome is a manufacturer of Hobby Polytunnels and Commercial Polytunnels, sole agent for Filclair Commercial Greenhouses, stockist for Eden Greenhouses, Elite Greenhouses and sole Irish agent for Janssens Glasshouses and Griffin Glasshouses. Polydome is located in Birr, Co. Offaly. Click here for contact details.